The recent jailbreak in Dera Islamil Khan was remarkably successful. More could follow. So what is the most secure place on earth? Fort Knox? Guantanamo Bay detention camp? A high security prison in Pakistan housing high-profile convicted terrorists and criminals? Scratch option three. On July 30, more than 100 armed extremists from Tehrik -i-Taliban Pakistan (TTP) entered Dera Ismail Khan, a city in the Khyber Pakhtunkhwa province of Pakistan. Accompanied by more than 50 large vehicles and motorcycles, the men were armed with assault rifles, rocket launchers, hand grenades, time bombs, homemade remote control bombs and suicide vests. 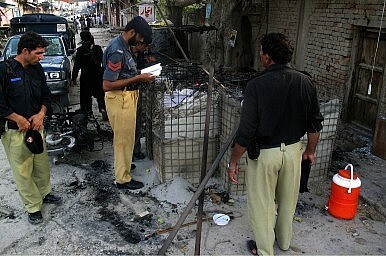 The attackers broke through the city cantonment and police lines and reached Central Jail D I Khan. There, they blew up the watch tower with a suicide attack, killed a couple of guards on duty and destroyed the central gate in an explosion. The guards and police officials inside the jail quickly surrendered. They opened the small gates of the prison, bringing to a successful conclusion one of the largest (and strangest) jail breaks in modern history, in a country with one of the most active security forces in the world. The attackers freed around 250 prisoners from the jail, including 49 high-profile militants, 6 death row prisoners, and 5 women. The operation lasted three hours, during which security personnel inside the prison took refuge in underground Nullahs. Despite more than 150 police stationed nearby, no backup appeared. The attackers were then able to travel some 216 kilometers unmolested to the Miran Shah Area of North Waziristan in Pakistan. Other than the dismal security performance and the surprising confidence of the attackers, there is another aspect to the story. The attackers had a list of people they wanted to spring from prison and a list of people to be assassinated. These latter unfortunates were allegedly involved in anti-jihadi activities against the Tehrik-i-Taliban Pakistan (TTP). They were identified and shot during the attack. The incident has not only prompted a deluge of criticism against the authorities; it has made clear the power these banned outfits still enjoy in Pakistan. The attackers seemed in no hurry, but the authorities, too, had intelligence warning of the attack. That makes the complete lack of resistance by the government or security forces all the more baffling. The mastermind behind the D.I. Khan attacks is allegedly Adnan Rasheed, a Taliban commander who was himself freed in a similar attack on Bannu Central Jail, KPK in 2012, along with 383 other prisoners, including 21 high profile criminals. Adnan is a former Pakistan Air Force Official who was convicted on charges of planning an attack on former President Pervez Musharraf in 2003. He was most recently in the news for penning an open letter to Malala Yousafzai, the schoolgirl who was shot in the head by the Taliban on a school bus last year. In his letter, Adnan attempted to justify the attack. Adnan created a wing under the name Ansar-al-Aseer (Helpers of the Prisoners) to plan jailbreaks. D.I. Khan seems to be the outfit’s first successful operation, and it suggests more are to follow. That leads us to Shakeel Afridi, the doctor who was convicted in Pakistan under Frontier Crimes Regulation (FCR) laws after his alleged involvement in a CIA-led fake polio campaign to identify and locate Osama bin Laden, and who is imprisoned in a jail in Peshawar. Afridi’s arrest and conviction along with the charges leveled against him is a strange story in itself. Afridi has been sentenced to 33 years imprisonment for anti-state activities, harboring terrorists including Mangal Bagh and other high-profile figures, planning attacks on security forces and providing financial support to extremist outfits like Lashkar-e-Islam (LI). Interestingly Lashkar-e-Islam representatives have insisted that they have no connection to Afridi. Not once does the conviction cite Afridi’s involvement in the unauthorized vaccination campaign or his links with the CIA. Most importantly, Afridi was sentenced under laws that have enough loopholes to enable him to be freed at any time the authorities deem. Guilty or not, Afridi is popular with Washington for his efforts in the bin Laden operation. That makes him all the more important for both the government of Pakistan and the TTP. For the government of Pakistan, Afridi can be used as a pawn anytime Islamabad feels it wants to pressure the U.S. on any issue. On the other hand, if the TTP gets its hands on Dr. Afridi, it can either use him as a bargaining chip or else punish him for his involvement with the Americans. With the extremists more openly confident and powerful, their next stop could be Peshawar Central Jail, where Afridi remains behind bars with just two unarmed guards. The provincial government has already asked Islamabad several times to move Afridi to a safer location, but the requests have been ignored. Even the more than 3000 inmates in the Peshawar facility pose an ongoing threat to Afridi’s life. In the meantime, Peshawar Central Jail remains a higher security risk than any other facility in the country. The United States and Pakistan run into another in a long string of difficulties in their relationship.